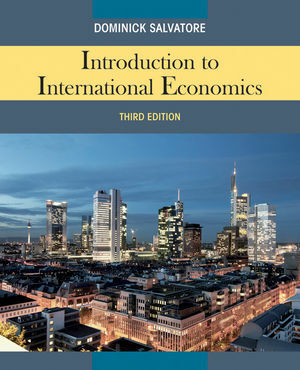 Introduction to International Economics, 3rd edition has been revised and updated to deliver the most current information on today's global economy for a one-semester course. Renowned educator and author, Dominick Salvatore provides a clear presentation making difficult economic principles easy to understand, in a global context. The text presents students with an introduction to the field of international economics using real-world case studies while pointing out to the student the relevance and importance of studying international economics. The text seeks to explain how the world economy works, the major benefits that it provides to people and nations, and the most serious problems that it faces, all in a clear and realistic way that students with a limited background in economics can understand. By covering the topics essential to an understanding of the global economy, this text is easily accessible for economics, business, and political science majors, alike. For any international economics course, Salvatore's 3rd edition takes the students' understanding of economics well beyond the classroom and across the globe. Dominick Salvatore is the Distinguished Professor of Economics and the Director of the Ph.D. Program in Economics at Fordham University in New York City. He is the Honorary Professor at the Shanghai Finance University and Hunan University and was a Visiting Professor at various universities including University of Rome (2003-2010), American University in Cairo (2007), University of Pretoria (2009), Peking University (2009-2011), University of Trieste (1996-2002), and University of Vienna (1995-2003). Dr. Salvatore is a Fellow of the New York Academy of Sciences and past Chairman of its Economics Section. He is also the past president of the North American Economic and Finance Association (NAEFA) and the International Trade and Finance Association (ITFA). He is a Consultant to the United Nations, the World Bank, the International Monetary Fund, the Economic Policy Institute, and several major international corporations and global banks. He is the co-editor of the Journal of Policy Modeling and the Open Economies Review, the Associate Editor of The American Economist and Frontiers in Finance and Economics, and the past Editor of the Handbook Series in Economics, Greenwood Press. He has given more than 500 lectures around the world, was awarded the Achievement Award by the City of University of New York in 1997, and was nominated for the 2010 National Medal of Science awarded by the President of the United States. • NEW sections have been added to reflect the further globalization of the world economy. • In-depth analysis of the most serious economic problems facing the world today and an evaluation of the policy options available to deal with them. • NEW content on the benefits and challenges of the rapid globalization of the world economy, competition from emerging markets, dollar-euro exchange rates, and the increased interdependence of world financial markets, is now included in several trade and finance sections and case studies. • Now over 85 real-world case studies have been added or significantly revised, from economics and business. • Thorough, intuitive presentation of all principles and theories. • A graphical approach throughout the book retains the same numerical example from chapter to chapter.